We are in a world where the world's population is 7.5 billion, the internet users are 4 billion, and the active social media users are 3.2 billion. (2018, Global Digital Report We Are Social) It is easier and harder to reach customers in this world than in the past. In the past, there was a difficult and costly process for exporting products to abroad, such as finding a distributor there, meeting with the companies there and getting to know them at the trade fairs. It is now much easier to sell products abroad as well as on B2B and B2C. Certainly there are problems with logistics and language, but these are also problems that can not be overcome anymore. Very simple texts that can be used especially for social media ads can be translated into a high quality language in English. If you are planning a small volume operation, it will save you. Of course, working with an experienced translator is always better. On the logistics side, you can greatly reduce your storage and shipping costs with the increase of fullfilment services around the world. When I think of exporting, Europe is always showing as a target with a reason that I can not understand. In order to break this down a little bit I will be talking about exports through social media. Our target country is Mozambique. One of Africa's poorest countries, annual income per capita is $ 1,300. Does not look like desperate, does it? No it is not. 10% of the population is twice as rich as the rest of the population. Again in similar proportions, internet penetration is 9% and close to 2 million users of social media. On the other hand, social media usage increased by 42% compared to last year. Over the next 50% growth is expected. So we are talking about 2 million people who have the money to buy our products. Unlike us in Mozambique, Instagram or Twitter is hardly ever used, but almost everyone with access to the Internet has a Facebook account and is very active. On the other hand, Mozambique Fashion Week has been organized for the last 15 years. You need to do a market research before trying to reach Mozambique through social media. One of the biggest mistakes made in social media ads is not getting the right targeting and segmentation. Especially when you give this job to an amateur, you will select all the Mozambichi and publish the advertisement. As a first job, we have to be able to see what 2 million people we have chosen to use in Mozambique. So which brands do people in Mozambique prefer? You can also search for the most profitable brands in Mozambique, the pages Mozambique likes on Facebook. A technology store called BancABC (Bank), Toyota, Coca Cola, Mazda and MozComputers is the most popular pages in the middle and upper segment of Mozambique. So if we target those who like these pages, we will reach the right mass. Perhaps B2C exports may seem costly at first glance, but their advertising costs are pretty low. Because on Facebook advertising is like a sort of live stock market. If the number of ads targeted to the person you are targeting is too high, then the cost of those people will increase. 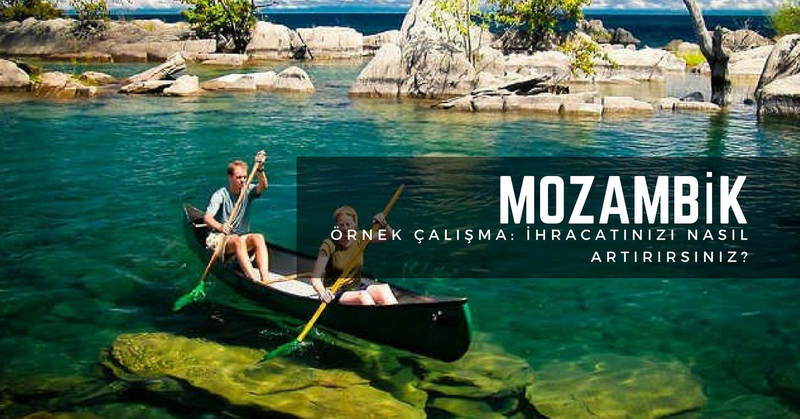 In a country like Turkey than in Mozambique is 10 times cheaper than you can show ads. All you need to do is find someone who speaks Portuguese. Again, perhaps the biggest social media advertising mistakes made in TV, newspaper or magazine ads, such as advertising. An advertisement in printed and visual media is prepared once and goes on the air. This rule is invalid in the digital world. You'll show 10 different ads to a target audience so you see which ad is more useful. On the other hand, you can also divide the target audience into as many segments as you can, so you can better measure what types of texts or images you like. So in Mozambique we have 10 campaigns with 10 x 10 segment ads in a campaign. In other words, you have to prepare 1000 different ad visuals and text. You should put your creative creatives on a budget for a small budget, and close off ads that do not bring sales that do not work after a maximum of a week. By analyzing the ads that are wrapped up, you begin to understand what kind of images the target kit likes and what kind of text you like. After that, you will increase the budget in good campaigns and prepare ads for new tests. On this page you can get maximum benefit by trial and error with very small budget even in a market you do not know. We even performing digital marketing in Turkey, with thousands of different ad / B tests are done. Exports will need much more than that. On the other hand, you get precise data on hundreds of thousands of people, much more precise than the information you can get from your partner, whether the people there like it or not. However, I want to be warned at a few points. First of all, social media marketing is not free. You absolutely have to spend an advertising bill. But of course you can do this much less than the price you pay for Mozambique TVs. On the other hand, you absolutely need a perfect website in Portuguese. 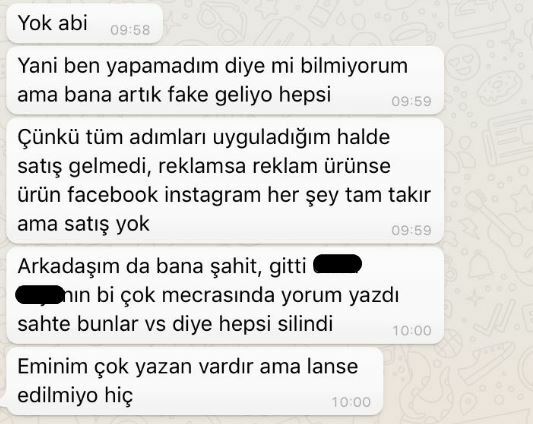 Mozambican talk you through Whatsapp do not think you trust someone enough to buy a single piece of products from Turkey. The e-commerce site will add confidence to you. On the other hand, the integration of Facebook Pixel and conversion codes must be fully configured on your website in order to get the statistics I mentioned. So far I have told you how you can make sales in Mozambique. What about branding? How can you transform into a brand known to all Mozambics like Toyota in Mozambique, like Dragon Energy Drink (South African origin), Truworths (South Africa Origin Clothing Brand)? You definitely think you will have to open a store and physically be there. There are 450 stores in Truworths, but none in Mozambique. On the other hand, 200 of those who like the Facebook page are from Mozambique. 200 thousand in Turkey, but might be small for a Facebook page inside Mozambique is quite large, there Truworths has managed to become a brand. Instead of opening up a different Facebook page specifically for Mozambique, we can target the site with shares that only Mozambics can see by sharing country-based targets on our existing page. First of all, it is necessary to investigate Mozambique cultures and what kind of social events they are celebrating and what days they celebrate. It is necessary to list which celebrities, which phenomena they follow, what kinds of sports they are doing and what they watch. It will be a banal example, but if you celebrate the Feast of Sacrifice of those who worship the soul when you say that I am targeting Muslims in India, you will have a bit of a headache. In order to avoid such small crises and win the hearts of the Mozambics, they will have to prepare their cultural content. You can take the first steps to become a brand from yourself by targeting the days when you feel national, like our 15th of July or 30th of August. Of course, it is not only possible to become a "brand" through social media, but you can make serious steps to increase your awareness especially on wealthy people. You can customize this model to any country in the world. All you need to pay attention is to examine the digital assets of the country. It is necessary to thoroughly investigate situations such as those where the constraints such as Iran and China are present or the alternative networks in the former Soviet countries are stronger. On the B2B side of the business, it is not possible to reach every country via LinkedIn. Once you become a brand demanded by B2C over social media with the support of alternative channels such as digital PR, you will also start to receive requests from B2B. It is important to remember that the way B2B goes through B2C. Dropshipping Training Do not be afraid of being plagiarized! A new, especially popular among young people rich way there is. Name Dropshipping. This concept, which lasts for 10 years, is actually in our lives, but recently with Dropshipping training and dropshipping, the youngest people who are the easiest fools to get involved with this richly-themed advertising come into this fury. I have to say it clearly from the beginning. You can make money with Dropshipping. But there are too many variables to make this happen, and most of these variables are not connected to you and what you do. For those who do not know, DropShipping is simply buying goods from China and selling them to citizens in the United States. However, unlike the general flow of e-commerce, dropshipping is not at all tangible. You do not even see how you send goods. When you place an order at the store that you opened in Amazon, this order is forwarded to Aliexpress, you are directing the customer from Aliexpress to Amazon. A kind e-commerce commission. So, What is the problem? 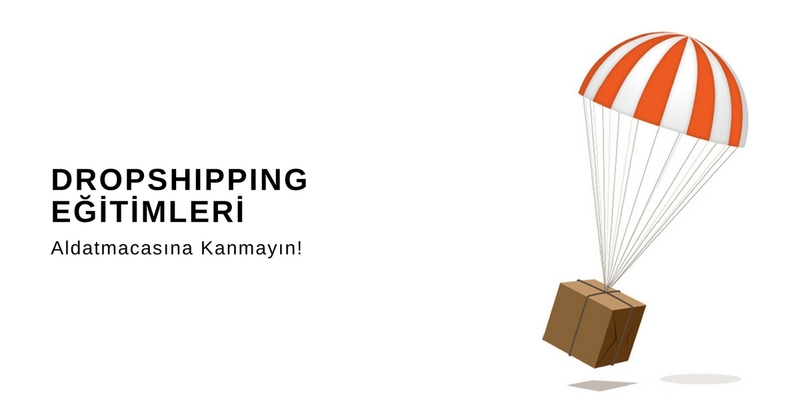 Dropshipping both in Turkey was launched on a large lot in the world fury. This fuss is being marketed with wealthy advertising and everyone is being pumped up as easy money. One day my brother Porsche and Lamborghini'si one day with photos of luxury hotels is taking photos, videos are published. Look, I live in this comfort zone, you leave your job, get your dropshipping training, and you get that comfort. How did I begin to deal with the subject? At the end of the conference, a few students are coming to the university to ask questions about dropshipping. At the end of a conference, a student briefly described his life. He was excited about the KYK scholarship and that his father had to pay for the hospital costs, had accumulated $ 250 to receive his dropshipping training, and soon he could treat his father abroad. At that moment I decided I had to do something. The first video you enter the marketing tunnel and the Facebook / Instagram ads you receive a lot of money to earn money for the message, but the cost of the training you get informed. First of all you need a company in the US so that you can receive your payments so you can use Paypal. There are costs such as taxes, cargo costs and Amazon commissions to be deducted from payments. It is important that you are not the first to try dropshipping or selling products from Amazon for the first time in the world. 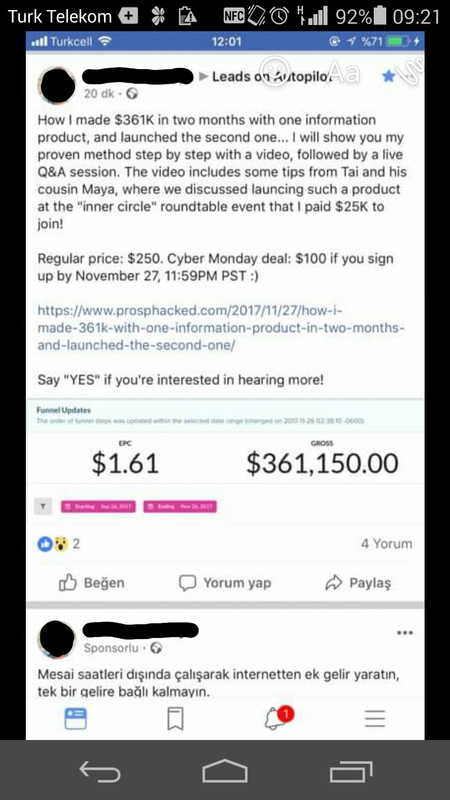 There are hundreds / thousands trying to sell the product you are trying to sell. To be able to stand out from them and stand out is definitely a serious advertising budget. You will need to sell your products with Facebook and Adwords ads. Funny figures like $ 5 a day are pronounced for this. Most of those who complete these trainings do not spend any sales, but spend their advertising dollars. How is a Neighborhood Print applied to those who understand Dropshipping Training? First of all, those who buy these tutorials communicate with each other in a closed Facebook group. The system inside is very beautiful. There are some winners here as well as the ponzide, and these winners defend their education and trainers as deli. This defense, however, is not innocent defense, but a fully pre-arranged and channeled defense to form a kind of neighborhood print. For example, when a person fails, it is his fault. For this reason, I see that because of this great neighborhood pressure people are afraid to pass on the bad experiences they have experienced. People avoid the negative experiences they experience from their surroundings. In the meantime, I'll use the text and I'll use the screenshots to tell the story. It is directly related to other people's despair. When I thought about where I could find the victims of this business, I came to think of dropshipping groups among them. However, those who entered the groups and victims who were victims of the contents of the victim will be deleted at the moment of contention will fill the contents of the defender. I share a shipment that I know will be nervous for that reason on Facebook. They moved to their own groups and a lot of people saw from there and told me about their victims. Related post. As you can see in the post, you can get a mini lynch attempt where everything is done, to say hello and to personal conversations. This is another reason why people are afraid. The last reason is Adnan Oktar tactic. If you go to the right to sue the one who says the worst thing about you, people are afraid to say bad things about you, but they say what will I do. When one of these guys did not say "cheat" about him, he said he was a cheater, approaching the courts in the way I would go. I see people digest people like this. Many entries in Ekşisözlük are removed in the same way. On the internet they have not left any content other than two or three (extremely poor quality) Youtube videos that tell these guys. The job of the neighborhood is trying to digest the fake accounts that are so advanced. Why does the system look like Culinary Bank? The Dropshipping method can be described in the mouth of the neighborhood because of the stomach of our e-commerce. However, the dropshipping education sector is very close to the pots. Above all, both you will be very rich There is one. In both of those who earn the most money system is winning. Again, while the majority in both are unsuccessful (only 5% succeeded in their mouths), the rest are sinking their money. Beyond all of this, the psychological dimension of the work is completely the same as the puddings and fake cults. Look at people I am making money, you are not enough, you should show others that you win. However, it is often difficult to complete fake earnings footage because it is difficult to do so with low success rate dropshipping. It is noteworthy that those who have been fired from the group but who do not want to be the defendants are noting that they share the screenshots of the mobile screen shots on T-Mobile with the operator part, the screenshots on the internet, The socialproof factor is very important to convince people. There was a woman who had been defrauded at culinary bank, so everyone was paying for it so we deposited it. Hele hele As Y and Z is the backbone, it seems like a great dream to become an entrepreneur in the field of knowledge, earn money in a short way and see everyone win. How Do Dropshipping Trainings Make More Money? These trainings are a kind of marketing tunnel. The training you get from $ 200-250 does not finish the job. After you have completed this training, you need to take another training to learn the job fully, another course on it, and then another ... Just training? How do you build a company in the US? We have a friend for him, and I know how many dollars he fired, you found the company, where's your accountant? Give me some more dollars to go the process. If you have invested so much money and still have not succeeded, we are putting the last point with buying advice from us. How can you live a victim on Dropshipping? I go to article matter. As explained above, Not zero! Company setup, taxes, cargo expenses, advertising costs are a must. Of course, if you are going to study, you will have to pay a few thousand dollars for training. If you do not fully understand the source above, do not go into dropshipping, because your English is weak. In Dropshipping you will talk to the customers individually, yes, no, you do not know enough. If you do not even understand what the Amazon is throwing at you, you will wander around to see why my account was closed. You are not the only one selling it on Amazon. You start at the end of the list on the list. You need to sell more than the other competitors in order to go up in the lists. Since you will send the goods from China and the sending period will be too long, you will be left behind if you get low marks on the lists. Your supplier will change the price while you try to sell it on Amazon, but you are not aware of it. You usually do it because of the difference. It is not easy to follow all the products you sell. I have passed the adults, they sell these trainings to the offspring. So the essence of the word, the most vulnerable, who buy luxury cars using the dreams of those who need the most money a pneumatic system is installed. 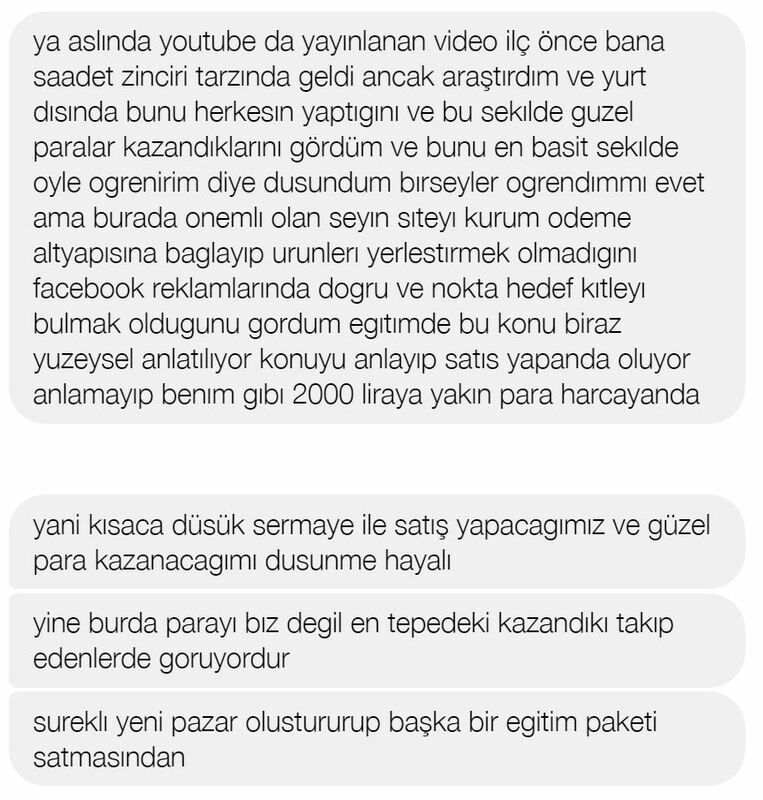 According to Article 57 of the Turkish Commercial Code, "to give false or misleading information about his personal condition, order, labor, business, business or commercial affairs; bringing them to a superior position relative to their competitors by acting in the same way about third parties; it is an unfair competition. " These ads are misleading advertisements, showing people special jet, luxury cars, cigars, luxurious hotels and "you will get this education if you are educated". The authorities will do the necessary thing against this publicly executed suicide. How can you improve yourself in the field of digital marketing? Digital marketing and social media areas have not trended down for the last few years. There are many ways you can follow to improve yourself on this field. I have explained how they can improve themselves in my lessons as an individual with more than 2,000 students. Especially I think it might be nice to give all these methods in one place. Let's start with the trainings in the sector first. Certificate programs are divided into two areas for digital marketing. The first is a long-lasting, ultimately certified certificate issued at a university or a MONE approved institution. There is also a distinction in long-term trainings. Some trainings stay in 50-60 hours, some 200 hours. I was also part of a 600-hour training course in 2012. In these tutorials I think the clock is very critical. For someone who wants to learn the basics of digital marketing is unlikely to be able to transfer anything in a short time. As far as you can do, it will go a little bit harder than saying "yes there is such a sector, the employees are doing nice things". There is one thing that business people are generally wrong about, what you are describing for a person who has never done anything on digital marketing before is like space science, and those who have never practiced it before once do not really understand anything. It is not possible to repeat topics in 50-60 hours because there are too many subtitles. A lot of them have to go deep. Even if you only think about SEO in the field of 40 hours after the end of the story, 50-60 hours seems not enough. Another issue is the level of knowledge of those who will participate in the training. Bachelor's degree is required especially in some educational institutions. I think this is about the fact that the industry's soul is unknown. sector make the job really good a lot of people are not universities, even some high school graduates. There is not much interest in digital marketing with the information taught to schools. Knowing the bases of marketing, knowing 4P, knowing positioning is very necessary but these can also be given within the certification program. It would have been so wrong to not be trained because he did not know these things. I will connect the requirement of undergraduate education to the academicians in the trainings. I was in the course of many academicians in the sector. Speaking of digital marketing, no one knows anything about the industry. The information is only in theory. If you tell someone who has never advertised Facebook in your life, you will not understand anything as a student. If he claims he understands, he will not rebel when he talks with the other trainers for 15 minutes. Having a large number of academicians in the selection of education is definitely a negative factor. Digital marketing is not a matter of theory like traditional marketing. You have to make plenty of practice. While performing these applications, you need something very important: a computer! You can trash complex trainings that do not indicate the obligation to bring a computer to the students or provide computers. Because these trainings are often referred to as seminar series. The cool impression of a person who has made a name in the industry and is probably not able to manage so much at all (apparently very bad with a professional eye) will be about telling the figures of Reach. That would be called a case study. When you ask a question that shows how you have implemented the application in this case study, you will not get an answer because those who set details did not make a name, they know the real job. Only the name of the director of the place was sold to you. Most of the directors did not change the title in his life, the guy who did not take the story in Instagram. The interesting thing is that most of them do not even have a social media account. It is necessary to mention this issue. Before I get an education, I always check the accounts of the trainer's social networks. I think that if you are training in social media, your own accounts will be managed properly. I think it's a necessary detail. Apart from long-term certificate programs, one or two day short certificate programs that are starting to become a new trend have begun to emerge. While these programs do not officially have the authority to issue a certificate (they do not have the validity of the certificate you receive from any organization other than Google), they are issuing certificates. In these trainings you get the opportunity to enter the details of a single topic. The model seems to grow rapidly because it is both profitable and trouble free. A two-day training specifically tailored to a topic such as Google Tag Manager, which looks particularly detailed in digital marketing trainings, can open your horizons. From this point of view you can improve yourself in the subjects you are engaged in with a one to two day training focused on one vertical subject. Another type of training I would benefit from staying away from is a few people who have declared themselves trainer and distribute certificates in their name. This type of training may be a bit horrible for those who have not been in the computer in your life, but you can not optimize the conversion of an e-commerce site. Another issue is books. You can really improve your digital marketing by reading books. To be honest, I can not find a book written by a Turk that explains social media or digital marketing in a comprehensive way. But there are very good examples from foreign writers. I especially care about books that are oriented to a single vertical. Of course your soul is also a separate obstacle to writing a book. Because your book tells you that there are 12 different types of ads while you are telling Facebook ads, the next day the number of ads with the update comes up to 14. You need to update the book before you print. From this point of view, it should be focused on marketing-oriented books, not digital-focused ones. 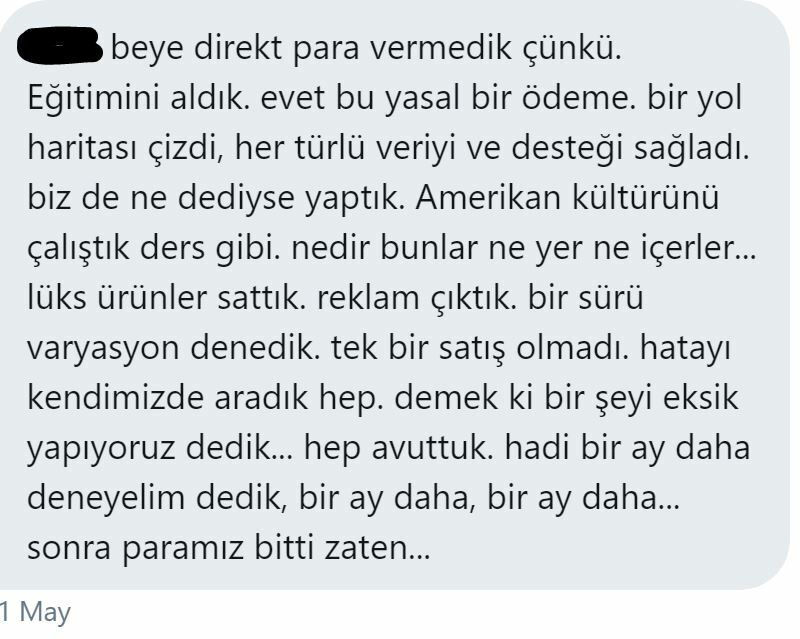 I would recommend marketing on undergraduate education or received no untrained people all the global perspective of the acquisition for marketing purposes in the foreign authors are written with the what passes reading his hands starting from classic in Turkey. Books are not the first source of our business unfortunately in our industry. The only place in our industry to catch our dynamism is blogs. But if you think blogs are coming up with your mind, you are wrong. The articles you can develop yourself are not news, but how-to articles. Google will not add anything to you this year, so I do not know what we're looking for, nor will it add anything to you knowing how much investment the startup has received. It is useful to follow the blogs which explain which optimization, which developer is to be done, how to use which application. These blogs usually consist of corporate blogs. In Yurtış (There are also a few great examples in Turkey) a digital marketing tool available on its own blog. These blogs do not publish frequently, but when they publish, they actually write something worth reading. I suggest you create a list of these blogs and follow them through Feedly. Another way to improve yourself is the videos. There are thousands of videos on how to use many applications on YouTube. Yes, most of them are not able to progress in digital marketing without knowing English and yes English. You can learn to use many digital marketing tools by following these videoras. On the other hand, Udemy also have a look at your training. Though most of them are in English, there are thousands of hours of training with great picture and sound quality. It will be a little self-promotion, but one of the effective ways to follow up on the latest issues and improve yourself is to become a strict journal reader. Although there are a few magazines with marketing content that have satisfying content, it is necessary to read them line by line without missing them. I would like to thank Brandmap for the value it has put into the ecosystem. Improve yourself with a free or paid events, you learn new things, completely different subject for an article in Turkey's really hard though. I think you do not have to rely on the activity and spend a lot of money. Most of the paid / free activities in the sector are very few of the chance to learn new things because the sponsors are full of speeches that they have defeated themselves. If I have to give you a little tip, it's usually the first amateur excitement quality content giving more opportunities to give. Of course, the fact that nobody is sponsoring new event sequences is another factor. To top it all off, it will be a cliché, but "The only thing you need to learn is that you do not want to learn." Indeed, who knows the job, who has the love of learning He needs people. People in these qualities can make career steps very quickly. Though your business is very difficult in many sectors, you need more in this sector than you think! The Cambridge Analytica event, the acquisition of data for 50 million people in the US, and the segmentation of this data to show separate ads for each segment. At the very beginning I will say at first. Here is the real digital marketing! There is nothing to do with this being unethical. What do you think the people who use Big Data in marketing are doing? I have been in marketing activities for collecting social data for brands and collecting data for years. All the major brands in the world are taking advantage of the power of DATA to be able to approach potential customers and customers more intelligently. How is he doing that? The mobile apps you've installed on your phone are fun things to do during 2010-2015 Facebook apps or even fun mini-tests that you can solve after you've signed in. All this is done only to get the data of the person. Join my application to get a chance to win a fancy gift, solve the questions asked, get the greatest gift to get the user data in style applications / competitions. 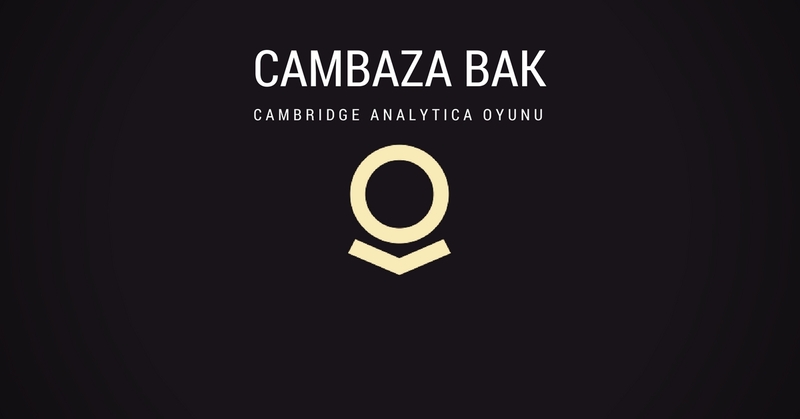 The only problem with Cambridge Analytica is that the data of the friends of those who use the application have to be obtained, which was a situation allowed by Facebook at that time. In fact, none of the things that Cambridge Analytica has done is contrary to the rules of Facebook. On the other hand, it is not an illegal situation, because all users are included in the application by accepting these conditions. Sometimes I think we miss the most basic points. Are you really seeing digital marketing as an alternative banner to billboard ads only? Do you think this is all your joke? What makes digital marketing different from other marketing activities is that it is fully customizable. It is worthwhile to be able to show ads for very small groups even if it is not a single person. Five fingers are five, not one friends. Neither of the consumers can be the same, so you have to prepare ads with separate messages for each consumer. I had waited a couple of days before writing this article, but I did not hear anybody telling me how things would come out sincerely. Perhaps it is because of the incidents that nobody knows what digital marketing is actually, even if I think of neighborhood pressure or loss of work. Immediately after the events of the trip, a proposal to send a party came to mind, I opened it immediately and wrote what I wrote. (Do not worry, the job has taken a nap) We offered exactly what Cambridge Analytica did. Divide the community into segments but divide the segments according to their ethnic, religious, political, and not the SES groups, and collect different data about these segments to show different ads through different pages / accounts. Because that's what it's supposed to be. Whether you are a political party or a brand, digital marketing is the way to go and this is the way to go. I picked an app from the Play Store. 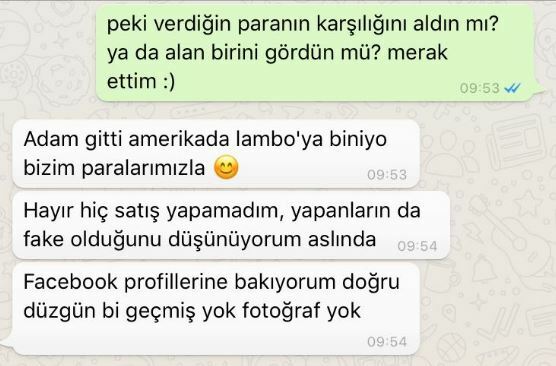 Akbank Direkt. As with all the applications that your mind might have, this application is also asking for tons of permission, and they have an object of appeal. Let's first look at what he asked for permission. It uses one or more of the following: SMS, MMS. Payments can be made for these. It uses one or more of the following: phone, call log. Payments can be made for these. This and other data processing activities are quite common. The person who will vote for the party against the vote of Cambridge Analytica means "to no avail." What is the difference between these campaigns that are spreading in every election, "Seal of the X Party, Y of the Party"? I'd love to believe that the writing of similar studies carried out by the political parties in Turkey. Unfortunately, in our politics, that head really does not exist. They still think that they have taken care of the rally squares with the # hashtagler hammer. Let me tell you the real threat of Big Data. Leave the magazines like Cambridge Analytica. Look at another company. Palantir. It is also known that the activities of the Palantir are reflected in the murders, drug trafficking, but the American Army is actively using Palantir in Iraq and Afghanistan. The CIA, one of the greatest supporters, is also wondering what Palantir's share is in the popular uprisings organized through social media. Do you know why it wonders? Founder Peter Thiel is one of Facebook's biggest investors. He's also a big Trump supporter. I d like to say that Cambridge Analytica is just a cambaza look game. Everyone is looking at the cambazaas and the pickpockets are assembled in the audience's pockets. With the arrival of Palantir on the agenda, he went to the stage. The real danger is not that the permissions you give to two or three applications do not show advertisements against you, but what companies like Google, Facebook, Apple, etc., that you have installed all your life do to your data. Data based Growth Hacking Consulting Would you like to know about it? Where the problem of Marketing Activities in Turkey? Which Events Should I Attend? marketing in Turkey, I would like to mention some of the activities in communications and digital ecosystem. I've never been abroad but seriously hard work in organizing events to organize activities in Turkey. Because people's demands and benefits will often not match up with your wishes. I will explain a little. First of all, I need to talk a little bit about the ecosystem. If we categorize events, we start by dividing them into two, free and paid. While there are a number of activities for free sector activities organized for the industry professionals such as Kworks, Habita, Kollektif House, Bilge Adam GO and Workinton, there are bigger activity areas such as Bahcesehir University, Boğaziçi University, Doğuş University, Istanbul Technical University and Bilgi University There are event areas that appeal to masks. Paid events are events that are held at the venues of the venues and congress centers, as well as mini-events at low-cost, shared office centers. I had to go to a categorization because I would evaluate each one separately. Events are also categorized as content. We can list just informative events, inspirational events, and events where speakers are presenting their own company. We need to understand once. People are not stupid. No one is going to listen to the company presentation for events where only speakers talking about their company. There are two types of people out there. This is because the auditor has sent the company, so you have to listen to the entire presentation, because the company is listening to your boss, asking if you paid so much or sending money or spending time with the phone while listening to the speaker and occasionally communicating with the attendees. So why is the situation so annoying? If you edit a paid event participants eat in Turkey, waiting for a cozy armchair and stylish environment. Even classical music plays, perhaps waiting for an entertainer to appear, seeing a couple of models or simply having fun. As such, there is little choice but to organize the event to organize the event. Prices for an average 300-person participant in the venues are around 100K. If your preference is Lütfi Kırdar or Golden Horn Congress Center, you can find 200-250K fares for 500-600 people. As a result, the event organizer needs to collect this money in some way, collecting the money through the sponsors as it is a little difficult to collect from participating participants. sponsorship yet not fully aware of the situation in Turkey. When you give the sponsor 10K money, it feels like the only owner of your activity. Why do I say that? Because he wants to see himself as the main speaker, the longest speaker and speaks only about himself and his company throughout his content. The best marketing is not marketing these speakers talk about themselves only when they try to make their principles unfair and usually they come to the conclusion that your activity is very useless in the analysis they have done after the event. The sales of our product did not increase, people did not share our talk about the activity, did not share the photos, like the people at the end of the event did not come to rain the question. Of course, you can not say that this end result is actually very normal, that people have not listened to it since the first 3 minutes. Particularly, the sponsorship networks of platforms that have made paid activity a long time and have turned it into a separate revenue portal have developed quite a bit. Now you can sponsor 50 if you have 50 speakers throughout the event. In better conditions, 10 out of 50 speakers are foreigners, the rest are sponsor speakers. Plenty of zeroes are required in these events. Unlike what you might think, these events do not cost you the expense of keeping the charges high. Those costs were already deducted from the sponsors and paid off. The main reason for the high prices is to keep the mass of participants in a niche piece. 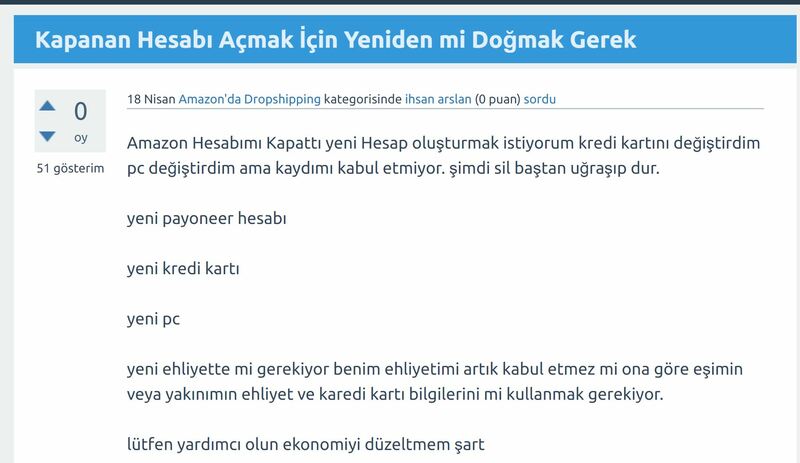 With a simple understanding, the purchasing power of a person who can give 3000TL for one day's activity is high and the target mass of the sponsoring companies are these participants. Sponsors are also sponsoring because of this understanding. I have always encountered this thought in my sponsor searches for the events I have organized. Because I wanted events to be accessible by wider masses, sponsors were always thinking the opposite. For this reason, it is more difficult to sponsor free events even though it causes more people to participate. There is also a proposal for those who are curious about organizing events in the paid activity area. The brands that have carried out their business outside of Istanbul have not yet seen this way. They are still able to sponsor events and act like a stakeholder, not really an owner of the event. The only annoyance in Anatolia is that they only mention themselves in the event they sponsor. But this approach can be made easier. Especially in Anatolia, the support of the Chambers of Commerce and Industry can be taken more easily, the salaries of the rooms are much lower and even the bartering doors are becoming more frequent. All of them are paid or free, Open to Anatolia! I never forget, when I told Growth Hacking in Van that people listened to the free attention, without missing a word. I have not seen a mass of such people in Istanbul yet. In free events, there is another distress. In general, they are divided into two speakers who have come to do their own advertising in terms of content and have come to teach something. If there is a free event with a large number of sponsors, then the content on that event is often ad-centric. While we were organizing the Marketing Meetup, we tried to break this perception and equip the first with free and completely ad-free content. I do not know how much I could change the industry, but my overall impression is that there are still a lot of free stuff in the free events, with a few exceptions. In particular, activities aimed at profit-oriented institutions under their own name are mostly based on introducing themselves. I have participated in hundreds of events until today. I've been filtering myself now. If a company's Turkey representative that global speakers while others do not listen to the speakers, great work usually tells his headquarters (in fact no work closely remotely similar to themselves) and they only introduce themselves. On the other hand, I am trying not to participate in many small events. I mean, I'm not amateur. The amateur spirit can sometimes do magnificent things, but there are also some activities that tell you how to say, they have prepared the banner with a dishwasher! In free events, it is really hard if you choose universities as an activity area. It takes great patience to deal with the bureaucracy, to do business with the employees of the university. Of course, you are bringing them from outside but even the guys who clean up the activity hall want money from you as well. I have yet to see a university that is really specialized in the event, no problems with the sound system, a solid internet infrastructure, and a good foyer area. Bilge Adam is currently in the GO once a month #godigital I organize events. In a friendly environment with few people, really pure informationIt turned into a series of events aimed at y. On the other hand, I am an old partner Marketing MeetupI would suggest that you follow up on an activity that is really planned for every step of the day. Soon there will be a few more new concept of events, a news story. (Curiosity, 20% discount code: HYDR) Digital Marketing School's events in Kworks are also nice in terms of content. Leanmarketing Growth Istanbul events organized by Userspots UX days they're really great. Analytics AcademyI have to take note of the pages in the events that are organized by Analytics. Organized by ZEO SEO eventsIt will not be too much to talk about, so a ladder would be so high? meetup.istanbulAnother activity series I enjoyed while listening to. Finally Digital Marketing TalksIt looks like it will be nice in the back, the team behind is pretty solid. If you are going to listen to the speakers, you have to think twice before going to the activities that are given thousands of pounds of personal recommendation. If you're going to get a network, that's the other course.